Shining 14K white gold and over a third carat of diamonds create this contemporary pendant that's perfect for celebrating a love with the power to sweep you off your feet. Half of this grace heart's curves are created by 13 diamonds that that follow the right side in sparkling unity. The other half is formed from a swirl of polished white gold that twists as if it had been painted by a skilled artist, adding a sense of life and movement. 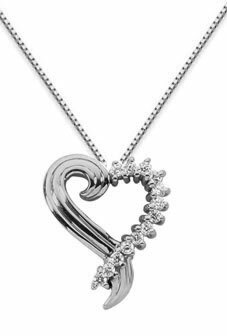 We guarantee our 0.39 Diamond Swirl Heart Pendant, 14K White Gold to be high quality, authentic jewelry, as described above.